The Government of the Kingdom of Sweden (Swedish: Konungariket Sveriges regering) is the national cabinet and the supreme executive authority of Sweden. The short-form name Regeringen ("the Government") is used both in the Fundamental Laws of the Realm and in the vernacular, while the long-form is only used in international treaties. 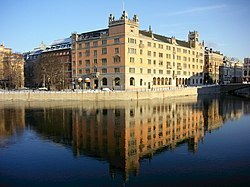 Rosenbad, in central Stockholm, has been the seat of the Government since 1981. Instrument of Government, Chapter 12, Article 1. —  The Government governs the Realm. It is accountable to the Riksdag. The Instrument of Government (Swedish: Regeringsformen)—one of the Fundamental Laws of the Realm—sets out the main responsibilities and duties of the Government (including the Prime Minister and other cabinet ministers) and how it relates to other organs of the State. —  The Chancellor of Justice and other State administrative authorities come under the Government, unless they are authorities under the Riksdag according to the present Instrument of Government or by virtue of other law. Most state administrative authorities (Swedish: statliga förvaltningsmyndigheter), as opposed to local authorities (Swedish: kommuner), sorts under the Government, including the Armed Forces, Coast Guard, Customs Service and the Swedish police. While the Judiciary technically sort under the Government in the fiscal sense, Chapter 11 of the Instrument of Government provides safeguards to ensure its independence. In a unique feature of the Swedish constitutional system, individual cabinet ministers do not bear any individual ministerial responsibility for the performance of the agencies within their portfolio; as the director-generals and other heads of government agencies reports directly to the Government as a whole; and individual ministers cannot intervene in individual cases in matters that are to be handled by the individual agencies, unless otherwise specifically provided for in law; thus the origin of the pejorative, in Swedish political parlance, term ministerstyre (English: "ministerial rule"). Image of the signature blocks with seals of the 2011 Croatia EU Accession Treaty for Slovakia, Finland, Sweden and the United Kingdom. Note that Sweden is the only one of the four not with its head of state as high contracting party. The Government of Sweden is the high contracting party when entering treaties with foreign sovereign states and international organisations (such as the European Union), as per 10:1 of the Instrument of Government. In most other parliamentary systems (monarchies and republics alike) this formal function is usually vested in the head of state but exercised by ministers in such name. Chapter 6, Article 7 prescribes that laws and ordinances are promulgated by the Government (by the Prime Minister or other cabinet minister), and are subsequently published in the Swedish Code of Statutes (Swedish: Svensk författningssamling). Following a general election, Speaker of the Riksdag begins to hold talks with the leaders of the parties with representation in the Riksdag, the Speaker then nominates a candidate for Prime Minister (Swedish: Statsminister). The nomination is then put to a vote in the chamber. Unless an absolute majority of the members (175 members) votes "no", the nomination is confirmed, otherwise it is rejected. The Speaker must then find a new nominee. This means the Riksdag can consent to a Prime Minister without casting any "yes" votes. Each appointment of a new Prime Minister is considered to result in a new cabinet, irrespective if the Prime Minister is reappointed or not. However, there is no automatic resignation following a defeat in a general election, so an election does not always result in a new cabinet. Chancellery House (Swedish: Kanslihuset) was the seat of the Government Offices until 1981, and the housed its predecessor, the Royal Chancery, dating back to the days of the Royal Palace fire in 1697. The Central Post Office Building, houses the Ministry of Enterprise. Previously known as the Royal Chancery (Swedish: Kunglig Majestäts kansli), the name was changed to the Government Offices (Swedish: Regeringskansliet) on 1 January 1975 with the current Instrument of Government entering into effect. The Instrument of Government briefly mentions in Chapter 7, Article 1 that there is a staff organization supporting the Government known as the Government Offices. The present organizational charter for the Government Offices is found in the ordinance named Förordning (1996:1515) med instruktion för Regeringskansliet. Since the issuance of that ordinance in 1996, all the ministries are technically entities within the Government Offices (headed by the Prime Minister), rather than as separate organisations even though they operate as such. Below follows a short summary of the current structure. ^ "Treaty between Sweden and Hong Kong" (PDF). The Riksdag. Archived from the original on 17 October 2017. Retrieved 2018-05-28. ^ a b c d e f g "The Instrument of Government (as of 2012)" (PDF). The Riksdag. Archived from the original (PDF) on 25 July 2012. Retrieved 2014-01-27. ^ "The Head of State". Government of Sweden. Archived from the original on 2014-02-25. Retrieved 2014-02-22. ^ "The Swedish Government Offices - a historical perspective". Government Offices of Sweden. Archived from the original on 2014-10-24. Retrieved 2014-10-24. ^ "The Swedish courts". Domstolsverket. Archived from the original on 18 June 2012. Retrieved 2014-11-09. ^ "Lag (1976:633) om kungörande av lagar och andra författningar" (in Swedish). Notisum. Archived from the original on 17 October 2017. Retrieved 2018-05-28. ^ "Premises of the Government Offices". Government Offices of Sweden. Archived from the original on 2014-10-24. Retrieved 2014-10-24. ^ "History of the Government Offices". The Riksdag. Archived from the original on 2014-10-24. Retrieved 2014-10-24. ^ "Förordning (1996:1515) med instruktion för Regeringskansliet" (in Swedish). Swedish Code of Statutes. Retrieved 2014-01-27. ^ "Government and ministries". Government Offices of Sweden. Retrieved 2014-10-24.